Some plants are just thugs with no redeeming social value. 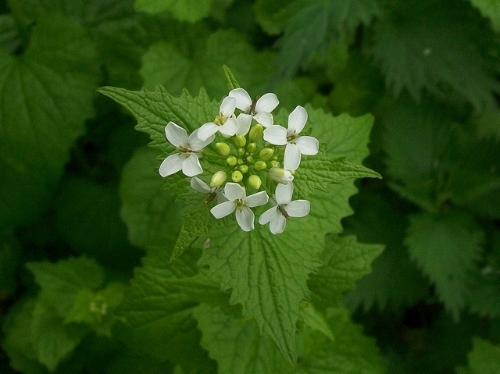 Take garlic mustard (Alliaria petiolata), one of the northeast’s most notorious weeds. This invader was first detected on Long Island in 1868, arriving with European settlers. It spreads aggressively in woodlands and shady river bottoms, swamping delicate wildflowers like bloodroot, Dutchman’s breeches, hepatica and trillium. It produces thousands of seeds that remain viable in the soil for years and monopolizes light, moisture and nutrients critical to more desirable native plants. It’s sneaky, too. In the first year, this biennial presents a low rosette of saw-toothed, heart-shaped leaves that look perfectly innocuous — you might think it’s a wild groundcover plant of some kind. In year two, it suddenly shoots up to two feet or so, producing clusters of small white flowers with four petals arranged like a cross. By the time it finishes flowering and sets seeds, you’re knee-deep in trouble you won’t soon eradicate. Should you wrest it from the ground (and you should), you will detect the odor of garlic from its crushed leaves and stems. The mildly tangy scent and flavor of this biennial herb, also known as “poor man’s mustard” and “hedge garlic,” is probably the reason it was imported by settlers from its European home. In its native lands, more than 30 insects and a variety of herbivores keep the plant in check. Here, it has fewer enemies and it has become the bane of American woods, floodplains, meadows and gardens. Even the deer won’t eat it, preferring our vulnerable native species instead. You, on the other hand, might conceivably enjoy garlic mustard in salads. All parts -- leaves, flowers and seeds -- are edible. But you’d be hard pressed to eat enough of it to make a dent in the population. A single robust plant can produce as many as 8,000 seeds and these can remain viable in the soil for five years or more. I’ve been fighting garlic mustard in the moist soil of my streamside woods and borders, and I’ve grown to loathe the stuff. Recent word from scientists that this plant is using chemical warfare to actively suppress the growth of native tree seedlings and other understory species makes me loathe it all the more. Garlic mustard really is launching a hostile takeover of North America. The process by which one plant exudes chemicals injurious to other nearby plant species is known as allelopathy. Perhaps the best known example is that of black walnut, which releases a substance called juglone from its roots that makes the surrounding soil toxic to other plants. If you’ve ever wondered why many flowering shrubs and perennials fail under walnuts, there’s your answer. Garlic mustard works a little more indirectly by impacting mycorrhizal fungus in the soil that is important to the growth and survival of common canopy trees. Studies published by a consortium of American and Canadian researchers report that white ash, red maple and sugar maple seedlings were dramatically suppressed by garlic mustard invasion. Scientists concluded that garlic mustard may have “profound effects” on forest communities by thwarting the regeneration of dominant canopy trees. If everyone worked at ridding their properties of garlic mustard, that would be a start. Smaller infestations can be hand-pulled, but be forewarned that eradication by this technique is not easily achieved. Research indicates that cutting flowering stems to ground level yields a 99 percent mortality rate (leaving four inches of stem reduces that to 71 percent death rate). The Nature Conservancy has had good results scything large, uniform stands of garlic mustard in combination with controlled burning, the latter a strategy you shouldn’t try at home. Don’t compost the stems and flowers you pull or cut — bag them and trash them instead to keep stems from re-sprouting. Remember that any seed left behind can germinate and begin the whole cycle anew. The worry is that this noxious thug of a plant might ultimately diminish our beloved native forests, rendering soil hospitable only to a selection of weedy species. The next time someone scoffs at the threat of aggressively invasive plants, ask them how much they would like to see our beautiful deciduous woodlands replaced by blankets of garlic mustard, tangles of Asian bittersweet and thorny thickets of Japanese barberry. I don’t consider myself a war-monger, but I want you all to take this report from the field as a call to arms. Sound the battle cry! Fight the evil garlic mustard wherever and whenever you find it. It’s the right thing to do.